Water and contact lenses don’t mix. Acanthamoeba keratitis is a rare disease that can affect anyone, but is most common in individuals who wear contact lenses. It is mostly frequently found in fresh water. We don’t know why, when two people go swimming in the same pool, only one comes out with the infection. What we do know is that the bacterium binds to a contact lens, remains in contact with the cornea longer, resulting in a significant increase in the infection among contact lenses wearers. • Remove contact lenses before any activity involving exposure to water, including showering, using a hot tub, or swimming. • Visit your eye care provider for regular eye examinations. 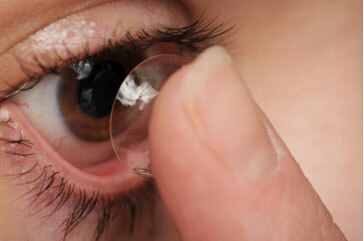 • Wear and replace contact lenses according to the schedule prescribed by your eye care provider. • Wash hands with soap and water and dry completely before handling contact lenses. • Parrelli Optical® recommends 1•Day contact lenses for our patients. 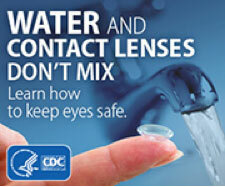 • Clean contact lenses according to instructions from your eye care provider and the manufacturer’s guidelines. 1. We recommend Clear Care, hydrogen peroxide based cleaning and disinfecting solutions for all our reusable contact lens wearers. • Replace storage cases at least once every three months. Contact lens wearers should remove their lenses and call their eyecare professional immediately if they experience any of the following symptoms: red eyes, pain, extreme light sensitivity, changes in vision, excessive tearing, ANY changes that are out of the ordinary, particularly if they effect only one eye. Ignoring these symptoms can lead to serious, sight-threatening complications. Healthy Habits = Healthy Eyes. Enjoy the comfort and benefits of contact lenses while lowering your chance of complications. Failure to wear, clean, and store your lenses as directed by your eyecare professional raises the risk of developing serious infections. Your habits, supplies, and eye doctor are all essential to keeping your eyes healthy.